"The Shankaracharya Temple,(Nastaleeq) is also known as the Jyesteshwara temple or Pas-Pahar by Buddhists. 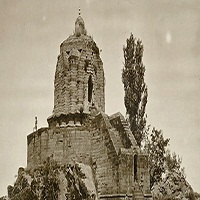 Shankracharya Temple was renamed as Takht-e-Suleiman (Throne of Solomon). It is on top of the Shankaracharya Hill on the Zabarwan Mountain in Srinagar, Kashmir. " It is dedicated to Lord Shiva. The temple is at a height of 1,000 feet (300 m) above the plain and overlooks the city of Srinagar.The temple dates to 200 BC, although the present structure probably dates to the 9th century AD. It was visited by Adi Shankara and has ever since been associated with him; this is how the temple got the name Shankaracharya. It is also regarded as sacred by Buddhists. The Shiv ling was placed inside during the Sikh period in the 19th century. It became an active Hindu temple when regular services were conducted. Some historians report that the temple was actually a Buddhist temple during the Buddhist era which was then changed into Hindu site of worship by Adi Shankaracharya. Persians and Jews call it Bagh-i-sulaiman or the Garden of King Solomon.